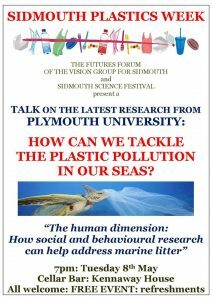 Jeremy Woodward and the Sidmouth Science Festival organised two students from the University of Plymouth who are doing their PhDs to come and talk to us as part of our recent Plastics Week. Imogen Napper, who is studying marine microplastics, spoke first. She was fascinating, explaining in simple terms how plastic is formed, the different types (High and Low Density Polyethylene (HDPE and LDPE), the history of plastic back to Bakelite in 1907, polystyrene 1929, polyester and polythene 1930. It’s cheap, malleable, can be made in vibrant colours, leading to huge leaps in agriculture, health, marketing etc. She is researching how plastic makes it into our environment, and just how many different types there are. She was instrument in getting microbeads from cosmetics and exfoliants banned – nobody realised just how many there were in a tube of harmless looking facial scrub until their extensive research was carried out – calculated using 6 household named products, it was found that there was a huge variation between 3g and 5.5g per tube (random even in the same product, no logical use for it really). There was also a huge range of particle sizes too. It was calculated that in the UK alone 86 tonnes of plastic went into the ocean just from microbeads from facial scrubs. Per 5ml squirt of facial scrub there were between 4,500 and 94,500 particles. This then gathers in the sediment on the sea bottom, terrifyingly. A public campaign them got them banned (by voluntary ban). Her most recent research is about clothing and the fibres from domestic washing machines, to see ultimately what can be done to prevent this massive problem. Imogen told us that from acrylic, 728,000 microfibres can be released during every wash. There is no solution yet. The main aim of the research will be to encourage business to take responsibility and she is keen to work with the fashion industry to achieve this. The different types of plastic make recycling so difficult so another aim of the university is to increase public awareness and be involved in social media campaigns to raise the issue as much as possible. 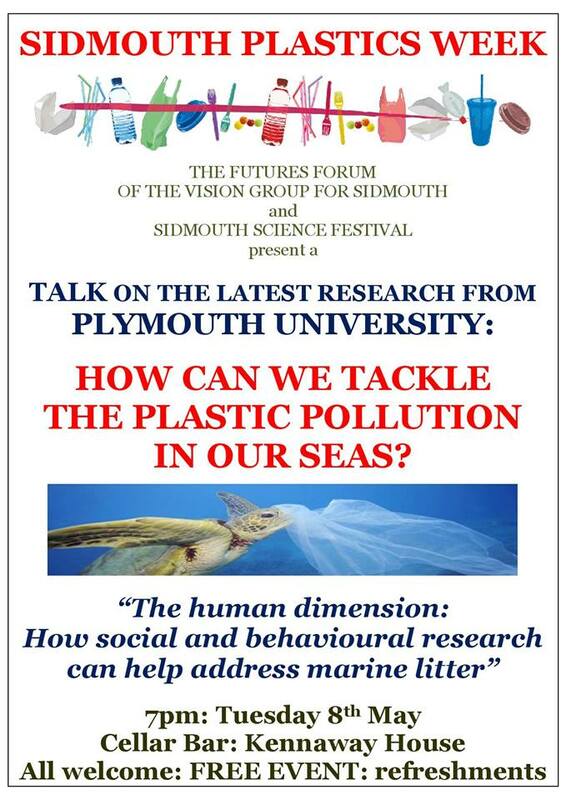 Next to talk was Sohvi Nuojua, who talked to us about the social and behavioural influence on marine litter – an environmental psychologist’s approach to understanding behaviour. The biggest predictor of caring is found to be education level and social norms and values play a big part. Some types of people are so conditioned to litter that they will not even notice it. She highlighted a useful document found here about influencing behavioural change. We must keep on educating, showing by example, and getting laws changed! This entry was posted in Meetings, Publicity, Town Action and tagged Imogen Napper, Kennaway House, marine, microplastics, plastic, pollution, university plyouth. Bookmark the permalink.